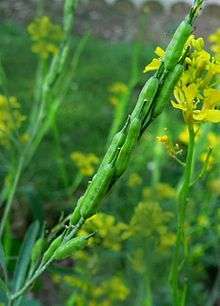 Brassica nigra (black mustard) ( Sanskrit : राजक्षवक, rajakshavak ; Marathi :काळी मोहरी, Kali Mohari ) is an annual plant cultivated for its seeds, which are commonly used as a spice. Black mustard plants in Saarbruecken. Black mustard fruits at the Jardin des Plantes de Paris. ↑ Post, George Edward (1900). "Mustard". In James Hastings. A Dictionary of the Bible. Wikimedia Commons has media related to Brassica nigra.